It’s been 139 years and three months since she stormed off the stage of the Royal Theatre in Copenhagen, infamously slamming the door behind her, leaving her husband and children behind so she could go find herself. It was the slam heard ’round the world. Audiences freaked out. A German actress refused to play the part unless playwright Henrik Ibsen rewrote the ending to “A Doll’s House,” keeping Nora home (he begrudgingly obliged). The original was banned from London stages. (One private reading, performed in a Bloomsbury lodging house, starred Eleanor Marx — Karl’s daughter — with George Bernard Shaw in a supporting role.) To some, Nora became a feminist icon. But that all happened in real time, after Nora’s exit. 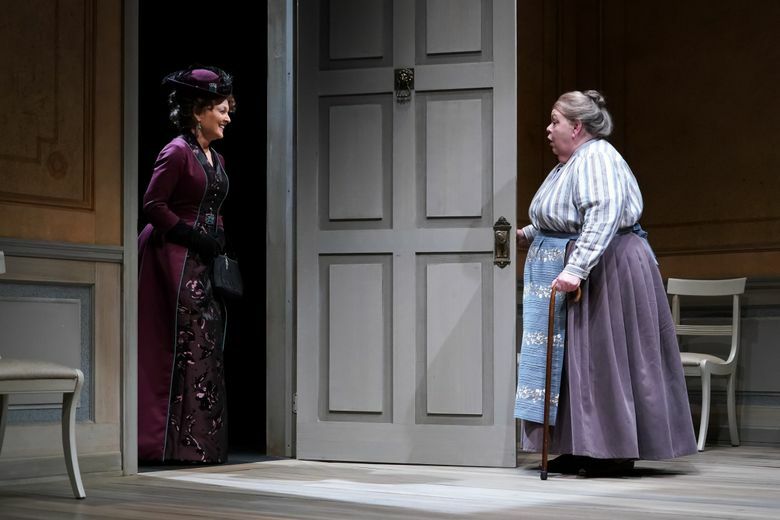 In the dramatic time of “A Doll’s House, Part 2,” Lucas Hnath’s Tony Award-nominated follow-up play now at Seattle Rep, 15 years have passed before Nora returns, politely but firmly knocking on the door she once slammed shut. “Well you hit a certain age,” Nora (Pamela Reed) says, smiling politely. “Don’t I know it!” Anne Marie groans, inviting Nora in to sit. Nora isn’t back just to catch up — she’s on a mission. In the 15 years since she left, Nora has become a popular and infamous writer, encouraging unhappy women everywhere to leave their husbands, and predicting the end of marriage as an institution. This being 1894, that’s a problem. A certain judge, whose wife took Nora’s advice, investigated the author and found an inconvenient truth that even Nora didn’t know — her husband, Torvald (Michael Winters), never filed for divorce. Nora assumed she was single and free and behaved accordingly: taking lovers, signing contracts without her husband’s consent, and generally doing things that would expose a married woman to prosecution. The judge wants her to publicly recant her inflammatory opinions or face the penalties. Hnath’s 90-minute psychological study doesn’t move more than a few feet from that front door (the receiving room, designed by Carey Wong, is a tidy, spare and emotionally cold place: just four chairs and a table) and remains unrocked by the family-drama bombs you might expect of an Ibsen, an Albee, or a Tracy Letts. 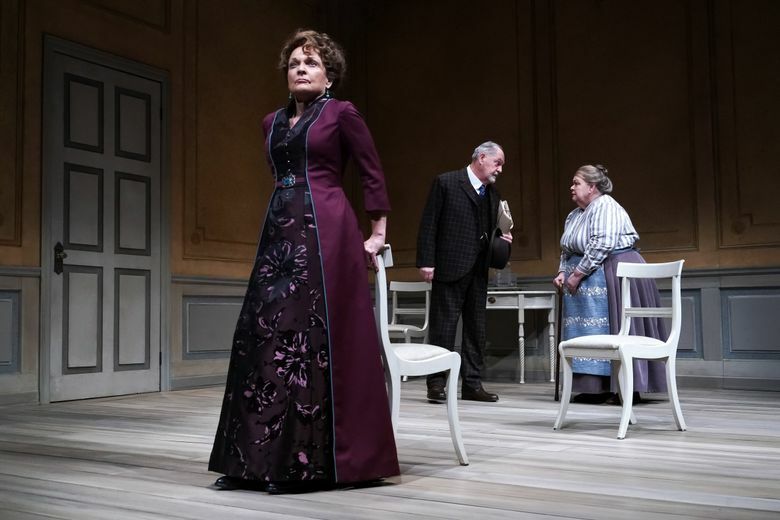 If you wiped “A Doll’s House, Part 2” of its Ibsen-ness (which wouldn’t be hard — change the title and the names), it would be a relatively slight play about a return and some re-ruffled feathers. Of course, complaining that Hnath ain’t Ibsen (or anyone else) would be stupid. Hnath is Hnath. But names have power. If you’re going to invoke a big one as your starting point, the obvious question arises: So … what do you plan on doing with that? Take, for example, “Cherdonna’s Doll’s House” at Washington Ensemble Theatre in 2017 (the same year Hnath’s play premiered). Drag queen/performance artist Cherdonna Shinatra staged it as a fairly straightforward period piece — except with her surreal, gender-smearing clown persona noodling around the otherwise staid household, unnerving the other actors and drawing squeals of delight from the audience before melting down into a personal, 21st-century version of a Nora-esque existential crisis. Cherdonna used Ibsen’s questions, which were radical for his time, and used them to ask new ones about gender, storytelling and what kind of theater gets seen in what kinds of places. She refracted Ibsen through her own prism. Hnath’s piggyback ride, on the other hand, is a well-made play — a very well-made play. But it lacks ambition. That said, the performances, directed by Braden Abraham, are quite good. Winters and Reed make a complex couple on stage: wary (and sometimes weary) of each other, but it’s not so difficult to imagine them in love long ago. And in some ways, their roles have been reversed — now she tends toward withering condescension, while Winters’ Torvald has surprising moments of sensitivity and self-sacrifice. Doan’s Emmy is a study in cool calculation, neither bitter nor particularly warm toward the newcomer. It’s a poignantly funny moment — everyone else in the play seems reluctant to love, reluctant to feel, but Anne Marie describes putting a dog down with special vim. Let the rest of ’em posture and position and declaim. She, at least, stares life in the face.